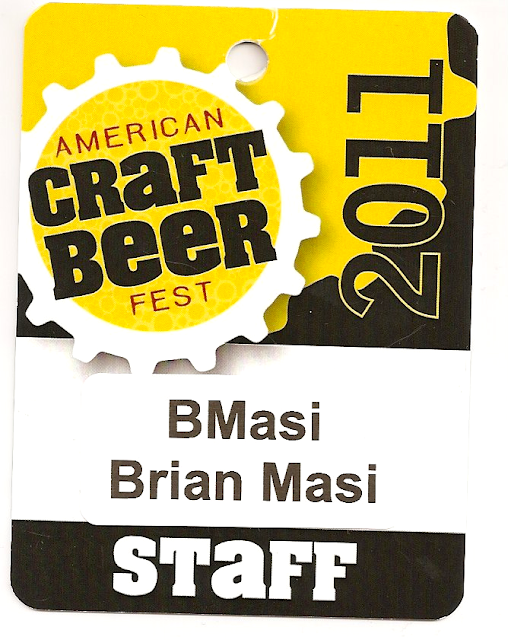 On Saturday June 4, 2011 I attended the American Crraft Brew Fest in Boston, Massachusetts. The festival was held at the Seaport World Trade Center with over 100 brewers, hundreds of beers to sample, and thousands of attendees over three sessions and two days. I was there as a volunteer for one session. As a monitor I was able to get a look at most of the booths and try a bunch of beers during my breaks. It was a lot of fun and something I plan ondoingagain in the future. I wasn't able to take as many notes as I was hoping to and didn't get any photos. I hope that next year I will be able to get some better coverage. Below is a listing of most of the beers that I was able to try with some of my short tasting notes. Maine Brewing Company - Peeper Ale - Golden color with a lightly bitter hoppy nose. Malty and slightly earthy with a moderate bitterness. Crisp with a dry finish. White Birch Brewing Company - Barrel Aged Elysium - Moderate flat brown with light hops, smoke, and a woodiness on the nose. Sweet with a slight charcoal bourbon component. Slightly boozy with a sugary finish. Watch City Brewing Company - Oink Oink Bacon Beer - Deep brown body, but clear. Prominent bacon on the nose, smokey with a lightly sweet malty aroma underneath. The beer is highly smokey, but the flavor is medicinal and artificial. Mixed reactions from most tasters, but I had to toss the rest of mine. Watch City Brewing Company - Lunar Shine Barley Whine - Deep brown with a malty aroma and big grapes. Strong and boozy with ample grape flavor. Grapes seem deep and sweet like concords with a slightly artificial finish. Dale's Ale - Scotch - A very slight nose, with a malty sweetness and light caramel. Beer is lightly winey and smooth with a light mouthfeel and seemingly minimal carbonation. Maine Brewing Company - Zoe - Hoppy, lightly smokey and earthy on the nose. A very crisp drying bitter hops component. The mouthfeel is slick with an oily hop resin on the finish. Watch City Brewery - Toasted Ah Ah Pale Ale - Tawny brown with huge banana phenols on the nose paired with lightly toasty malts. The beer is sweet and big on the malts. The banana holds true and gives the beer a smooth mouthfeel. Mendocino Brewing Company - Blonde Ale - Light honey colored straw. Light hops accent a clear and clean floral honey sweetness with a modest carbonation bite. Surley Brewing Company - IPA - Light clear straw with moderate hops on the nose. Malts are clear and very fruity. The beer has a spicy Belgian profile. It is light on the hops, but very tasty. Slightly watery mouthfeel near the finish. Cape Ann Brewing Company - Sunrise Saison - Slightly tawny hazy straw body. Banana phenols are prominent with a light spiciness. The beer is grassy, but sweet and fruity. Cape Ann Brewing Company - Bavarian Wheat - Sweet and spicy, but slightly medicinal on the mid-palate. Tasty and refreshing overall. Cape Ann Brewing Company - Tea Party - Fluffy head with an understated nose. Mild smokiness but medicinal and gross. Sweet and cloying. Jackie's Pub and Brewery - Hocking Triple - Darkish hazy straw with a sweet boozy nose. The beer is boozy and leafy with a slight spiciness and a mild tea-like component. Boulevard Brewing Company - Quadrupel - A modest brown with a deep amber glow and a surprisingly light nose. Minor dark fruits add sweetness to the boozy and strong beer. Tight carbonation, but silky with a slightly minerally water edge. Lake Placid Brewing Company - Hefeweizen - Sweet and light nose with banana phenols and prominent wheat malts and spice. Malts are thin and watery. There's a nice, but light, spicy coriander edge. Lake Placid Brewing Company - Ubu Ale - Deep, but moderate brown Toasty sweet and lightly earthy with moderate chocolate. Crisp finish with lingering hops. White Birch Brewing Company - Wrigian - Hazy medium brown body. Brown sugar sweetness with wheat malt characteristics. Rye malts add depth and a pleasantly light spiciness. White Birch Brewing Company - Hooksett Ale - Brownish, hazed amber with a citrusy hop aroma. White Birch Brewing Company - Oak Aged Tripel - Sweet winey green grapes. Slightly tart and refreshing. Lightly boozy with a light and clear finish. Stone Brewing Company - Russian Imperial Stout Belgo - Deep brown with an orangey glow. Lightly smokey with licorice on the nose. Smooth and smokey, clearly strong, but not overwhelming or alcoholic. Anise hints and a spicy Belgian yeast profile. * - My notes didn't always include the full names of the breweries or beers, so some of the names may be incomplete or inaccurate. If I can, I will update this post with corrected names. This post is coming while I'm on the road, so double checking names and posting is more complicated.